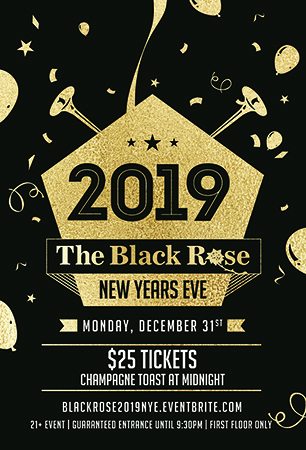 Ring in 2019 at The Black Rose! Live Music begins at 9:30 PM! $25 for each ticket - includes a champagne toast at midnight! This event is 21+. By purchasing this ticket you are guaranteed entry before 9:30pm. There is no alcohol permitted on premise other than that served by the license vendors of this event. Unruly conduct, excessive intoxication, or improper identification (only proper Driver’s license or Passport will be accepted) may result in denial of entry or ejection from the venue at the sole discretion of their security staff and/or management, without refund of the ticket purchase price.